This is one of two famous gold snuff boxes set with miniature paintings by Louis-Nicolas Van Blarenberghe which once belonged to the duc de Choiseul. This box, until recently part of the collection of Baron Elie de Rothschild, was commissioned by Choiseul at the height of his power in 1770 and depicts the interior of his Parisian mansion (inherited by his wife from the wealthy financier Pierre Crozat). Choiseul was a great collector of Dutch and Flemish, as well as contemporary French, genre paintings. Pierre-Francois Basan, one of the most eminent experts of the time, catalogued his collection in 1771. Sadly many of Choiseul's paintings had to be "sacrificed" in April 1772 following the minister's fall from grace and the remainder were disposed of in December 1786 shortly after his death. So detailed are the miniatures, that it is still possible to identify many of the individual paintings from their tiny depictions. Today little remains to be seen today of the Hôtel Choiseul which was sold just prior to Choiseul's death and later subdivided into apartments (91,93.95 rue de Richelieu). 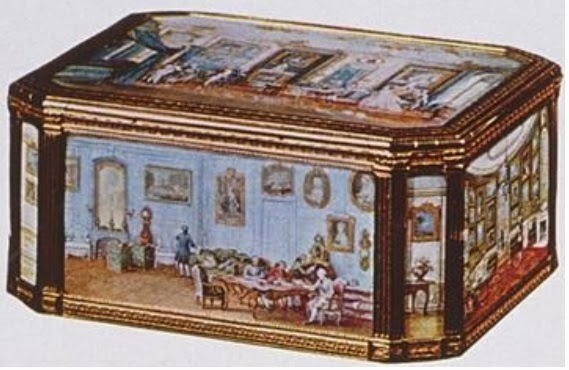 Choiseul's bedchamber in winter furnishings (lid of box ). 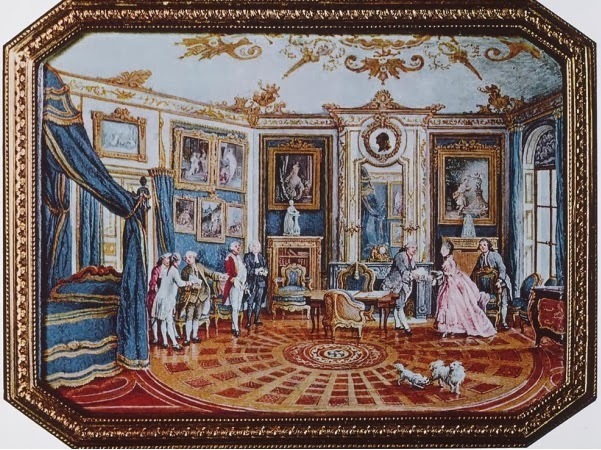 This is clearly the room depicted in Adélaïde Labille-Guiard s portrait. The career of Louis-Nicolas Van Blarenberghe exemplifies the quiet subversion of the world of academic painting which took place in the later eighteenth century. A member of the Lille painters guild, he seemed outside the boundaries of establishment art, specialising as he did in miniatures and battle scenes in gouache. 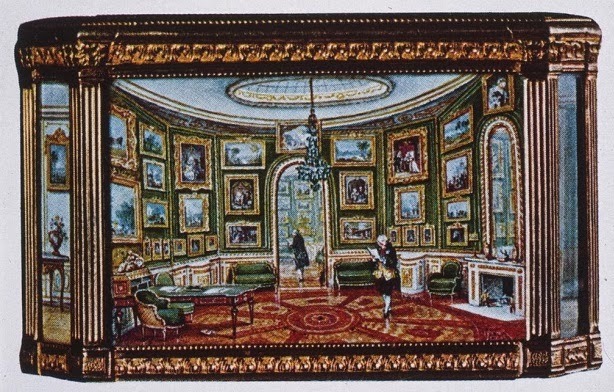 He gained unlikely success after 1761 when a commission from Peter the Great created a fashion for his tiny interiors and domestic genre subjects; in 1767 Choiseul secured for him an official position as "painter of battles" and he counted among his patrons the likes of Catherine the Great, Madame de Pompadour and Cardinal de Rohan. 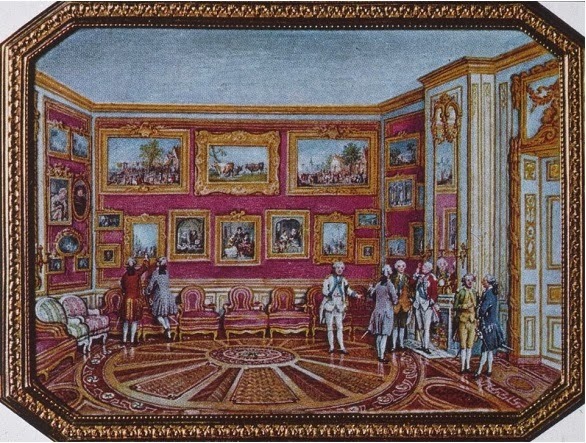 A box, now lost, depicted Louis XVI being shown around the Louvre by the comte d'Angiviller at a time when it was planned to put parts of the royal collection on public display. 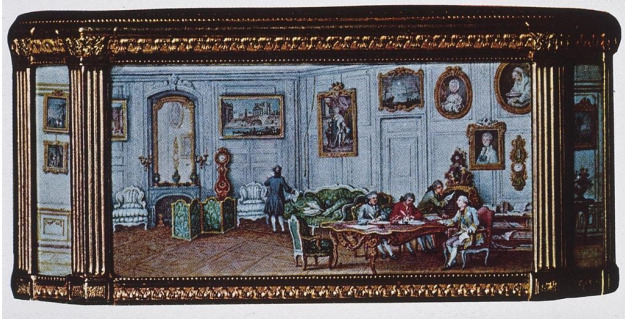 This is another miniature by Van Blarenberghe, again set a snuff box, which shows Choiseul's bedchamber, this time in its "meuble d'été" of light flowered silk. 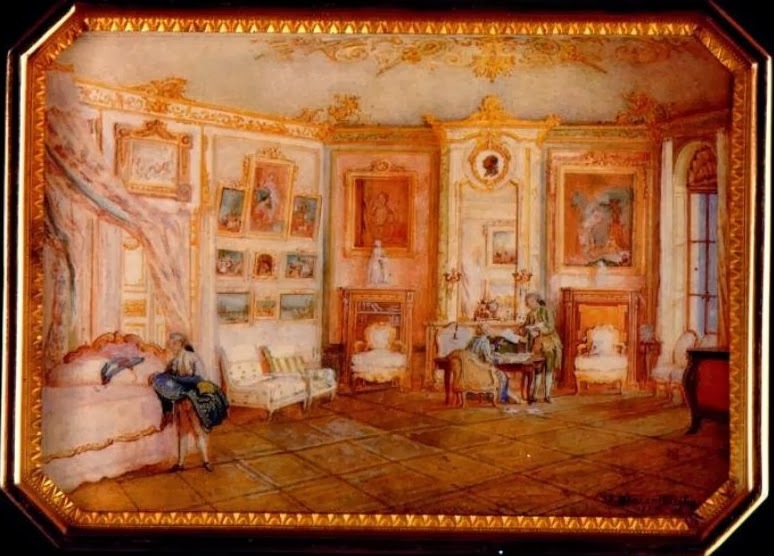 Choiseul's "bedroom" was clearly an informal reception room rather than just a place to sleep. [Louvre, 8.4cm x 6.4cm ca.1770]. I just watch the movie Danton, about the Terror, and curiosity sent me to your blog post. Very interesting, thanks!